Highly rated and well received by manufacturers and customers alike, the Fruit of the Loom 3931 High Density HD T-Shirt is built to receive your design. 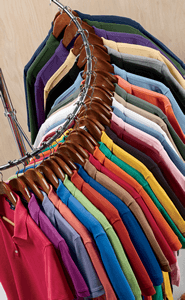 The tight knit jersey fabric creates the optimal smooth surface for all types of direct-to-shirt printing processes. Your crisp edges will remain unfettered by loose threads, providing a finished product that is visibly distinct and clear. Pair your art with with one of the 52 choices in our spectrum of colors, and you will have a custom design that is anything but ordinary. Even though the 100% cotton fabric is dense, it weighs only 5 oz. and embodies the light, airy feel of your favorite tee shirt. The double-needle cover stitched front neck allows for a seamless 1x1 ribbed collar which lays flat and comfortably, while the double-needle stitched sleeves and bottom hem give extra reinforcement where you need it.